If you are considering installing or upgrading commercial security systems in Hertfordshire you need to sit down and think about exactly what sort of system you need. If you run a small shop or office with few personnel you may be able to use something akin to a home security system, but if you have larger premises, more employees, and/or have high value assets you need to consider more sophisticated business security in Hertfordshire. For example, your business may need access control in order to prevent unauthorised entry to your site, and this can be operated in a variety of different ways. 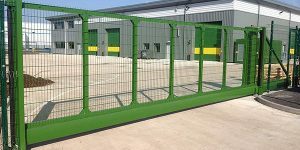 You can have electric gates which can be of the swing or sliding variety depending on the layout of your entrance, or could be of a turnstile type for personnel without vehicles. Access can be gained by authorised persons with a keypad into which they enter a code or swipe a magnetic card, or even fingerprint recognition. Number plate recognition could be used or, if you have a gatekeeper, gates can be opened physically or remotely by a security guard. Do you need a security camera system in Hertfordshire to monitor gates, or indeed any other area such as a car park, or other buildings on your site? Are there buildings or areas on the site to which only certain personnel are permitted access? Access can be gained to protected areas by similar means to that used in entrance gates. Probably the most secure method is by fingerprint or voice recognition: if a swipe card or a code is used to gain access, it would be possible for an authorised employee to pass the code or swipe card to an unauthorised member of staff. Other things to take into consideration when reviewing commercial security systems in Hertfordshire are fire, smoke, and water alarms, and also the ease of exiting a building or an area in the event of an emergency. 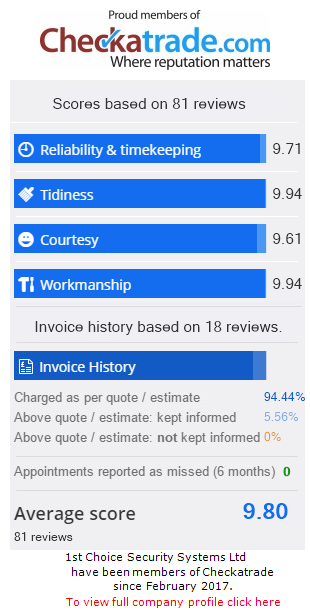 Contact us today on 0800 118 2414 for a free quote! In addition, you may wish to be able to check the status of your business security systems in Hertfordshire remotely by use of a mobile phone, tablet, or laptop from home or from anywhere on the go. In the 21st century it is easy to control the system and check its’ status from anywhere you may be. Commercial security systems in Hertfordshire can also now include high definition video cameras. Up until very recently video evidence did not qualify as admissible evidence in many courts because the quality of video was very poor. However, you can now get video of high quality that can also allow playback one frame at a time allowing for extreme accuracy. Another thing to consider about commercial security systems in Hertfordshire is whether to have a wired or wireless installation. Installing wiring in an existing building can be labour intensive and involve extra expense. In addition, traditional alarm systems use telephone lines in order to send alerts, and if a storm causes telephone lines to be broken there will be a problem. You really need a cellular backup to ensure that your Hertfordshire security system is always viable.